What caused your motorcycle crash? It’s profoundly freeing to ride a motorcycle on the open highway—few feelings come close. Frustratingly, though, bikers are among the most vulnerable people on the road. Even minor collisions often lead to severe injuries. Intuitively, we understand why. Motorcycles lack basic safety features—like airbags and seatbelts—that come standard with other vehicles. They also don’t have a metal framework to protect cyclists during a crash. Newton’s First Law, the “law of inertia,” tells us that an object in motion tends to stay in motion. When a motorcycle comes to a sudden stop, its passenger will continue to move—and possibly get ejected from the vehicle, depending on variables such as the bike’s deceleration, frictional forces between the rider and her seat, and even the surface of the road. Per the law of momentum, the faster a motorcycle goes, the longer it will take to stop. A rider ejected from a bike at 50 mph will—according to idealized physics—fly twice as far as one ejected at just 25 mph. If you’ve ever taken an introductory physics course, you may recall that force changes the motion of an object. When a net force acts on an object, it accelerates. Picture a pair of dice hanging from your rearview mirror. The dice will swing backward if you push the gas and accelerate your vehicle. In more technical language, we say that the force imparted equals an object’s mass times its acceleration (F=ma). A related idea is torque. When a motorcycle takes a turn, centrifugal force—in this case, friction between the tires and the road—pushes it towards the center. This basic physics explains why riders can lean into turns without falling. However, when an outside force disrupts or unbalances these forces, the vehicle crashes. For instance, loose pebbles or wet pavement may reduce the frictional force between your tires and the road, causing a spin out. This article from Wired discusses torque-related accident in more depth. And here’s another Wired article—The Physics of Nearly Killing Yourself on a Motorcycle, by physicist Rhett Allain—that provides a more technical and mathematical discussion of this subject. 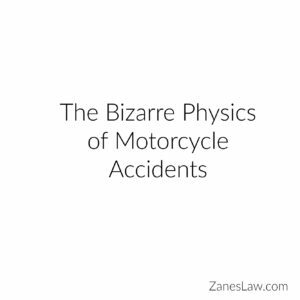 No matter what happen in your motorcycle crash, or how complicated the physics involved, our experienced Phoenix accident attorneys at Zanes Law are here to help. We will fight to get you fair, complete compensation for your damages. Please call our team in Phoenix today at (602) 999-9999 to schedule a private consultation.